So yesterday may have just been an ordinary Friday to most of you, but it was my 23rd birthday! I still had to work like any other Friday (my lovely boyfriend set "What's My Age Again?" by Blink182 as my alarm so I got to wake up to the line "nobody likes you when you're 23"), but afterward he took me out to dinner and then took me shopping to choose some birthday presents (let me know if you’d like to see a post on what I chose!). I did my usual kind of everyday makeup look, but introduced a few new products into the lineup. 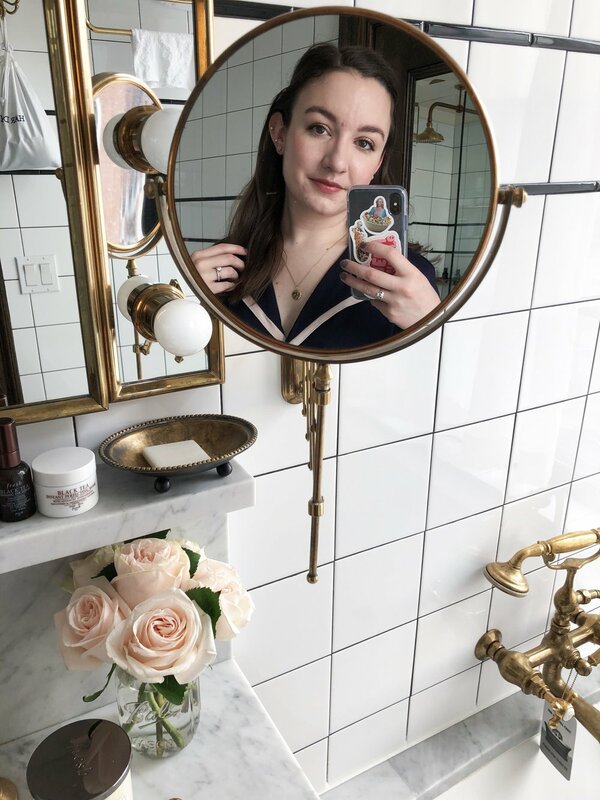 I started off with a new addition that I’ve become absolutely obsessed with, the new bareMinerals Complexion Rescue Tinted Hydrating Gel Cream (anyone else feel like brands are in a never-ending contest to come up with the longest product name?). This is unique among the many tinted moisturizers I’ve tried, because it actually feels like it’s doing something for the skin. Coverage levels are about the same as any tinted moisturizer, but it gives an amazing glow that actually sets so you don't get that "sticky" feeling, or even feel it on the skin. I used another new addition on my cheeks, the L’Oreal Visible Lift Blur Blush in Soft Pink. I saw this in Essiebutton’s No Makeup-Makeup video and it seemed right up my alley. I love cream products, first of all, and I loved that it had a sheer buildable texture. I finished off my face with my usual light contouring with the Anastasia Contour Kit and subtle highlight with the RMS Beauty Living Luminizer. I did my brows with my usual Anastasia Dipbrow Pomade, then moved on to a new (to me) eyeshadow. I got the MAC eyeshadow in All That Glitters from my sister last weekend as an early birthday present and wore it every day this past week. It gives just the perfect shimmery peachy pink wash of color. I paired it with a little bit of Sable in the outer corner and through the crease. I smudged a little of the Urban Decay 24/7 Glide-On Eye Pencil in Corrupt into my lashline and finished off with a coat of the L’Oreal Miss Manga Mascara. On my lips I started with a base layer of the MAC Lip Pencil in Soar and topped it off with the MAC Lipstick in Brave. The resulting look was similar to my usual everyday makeup, but it felt a little more special because I was using a bunch of newer products. I took my time applying it and really enjoyed it even though it was 6am. Have you found any new products you love lately?